1-The tours will be held in a negotiated manner. If it is deemed necessary by the Tender Commissions, the tenders may be finalized by auction with the participation of the bidders who have continued negotiations. 2- Participants may bid for more than one immovable provided that they are separate. If more than one immovable is bidded, these bids can not be related to each other. 3- In order to be able to participate in the tender, it is obligatory to receive separate Tender Specifications for each immovable and to submit the tender to the address of Ziya Gökalp Street No: 80 Kurtuluş / ANKARA by the end of the last bidding day 17:00. One of the accounts will be deposited. At the deed, the name of the participant (if the participant is a Joint Venture Group (OGG), it is sufficient that the OGG or one of its members is regulated) and the document for the immigration will be specified. In any case, the amounts paid to obtain the Tender Specifications and the Presentation Document will not be refunded. 5- The privatization tender is not subject to the Public Procurement Law no. 2886 and the Administration is free to do or not to do the procurement.The Contracting Entity is free to extend the deadline for submitting tenders by a certain amount or by a certain amount to be determined. This will be announced before the end of the last bidding period. At least 20% (twenty percent) shall be calculated in advance at the signing date of the Immovable Sale Contract and the remaining principal amount shall be calculated at maturity dates of up to 48 (forty-eight) months with equal installments, Will be paid together with the maturity differences. Simple interest shall be applied on the tender price of the tender price per annum from the date of the signing of the Immovable Sale Contract by 10% per annum (ten percent). 7- The sale of the tendered immovable real persons to real persons with foreign nationality, to companies with legal personality established in foreign countries in accordance with the laws of their own countries and to the foreign capital companies established in Turkey is subject to the provisions of the Direct Foreign Investment Law and other legislation related to the Land Registry Law. These persons are obliged to investigate whether the sale is possible and to take necessary actions in the shortest time if they win the tender. 9- In addition, telephone numbers 0 312 585 84 54-585 84 91, 0349 585 83 54 fax and www.oib.gov.tr can be obtained from the information about the tender. MESBAŞ-Mersin Free Zone Founder and Operator Inc., which is a wholly-owned subsidiary of Türkiye Marinilik İşletmeleri A.Ş. (TDİ), representing a capital of TL 2,296,656.- in the issued capital of TL 10.804.320, , TC Will be privatized by the “Privatization” method within the scope of the provisions of Law No. 4046 by the Prime Ministry Privatization Administration (Administration). 1. The tender shall be realized by means of “bargaining procedure” by taking bids and negotiations within a closed envelope from more than one tenderer. If deemed necessary by the Tender Commission, the tender may be concluded with the auction to be held with the participation of the bidders holding the negotiation negotiations. (If the participant is a Joint Venture Group, he / she shall be entitled to be issued on behalf of the Joint Venture Group or a member of the Joint Venture Group if he / she participates in the tender, including the statement “MESBAŞ Tender Specifications and Presentation Document” ) May be obtained by contacting the below mentioned address of the Contracting Entity, signed by each of the members of the Joint Venture Group and the real / legal persons bidding for the tender of the Declaration of Confidentiality, which is clearly stated in the declaration and shared in our Administration website. In any case, the amounts paid to receive the Specification and the Presentation Document will not be refunded. 3. Real and legal entities and Joint Venture Groups may participate in the tender. Mutual funds may only participate in the tender including in the Joint Venture Group. The Joint Venture Group can not consist only of mutual funds. 4. In order to participate in the tender from the Bidders, a temporary security deposit will be required in the above table. 5. The proposals shall be prepared in accordance with the conditions specified in the Tender Specifications and shall be closed at the latest until 17:00 at the latest on the date of the last bidding at 17:00 o’clock with the statement “PROPERTY – CONFIDENTIAL FOR BIDDING FOR THE PRIVATIZATION OF THE SHAREHOLD OF THE SHAREHOLDER WITH 21.26% Must be submitted in an envelope to the address below of the Contracting Entity in person. Proposals to be given to the Administration after the deadline date and time of the last bidding shall not be evaluated. 6. The Contracting Entity is free to extend the deadline for submitting tenders by a certain amount or by a certain amount to be determined. This will be announced before the end of the deadline. 7. The tender for privatization is not subject to the Public Procurement Law no. 2886, and the Administration is free to do or not to do the procurement. 8. Real persons of foreign nationality, companies with legal personality established in foreign countries in accordance with the laws of their own countries and shares of foreign capital companies established in Turkey are subject to the provisions of other legislation related to the Direct Foreign Investment Law. Proposal Owners / Buyer is obliged to investigate whether demurrage is possible beforehand and to make necessary transactions in the shortest time if they win the bid. 9.Customization procedures are exempt from all kinds of taxes, duties, fees and KDV. 10.Other information regarding the tie-up can be obtained from the telephone number 0312 585 80 80, the facsimile number 0312 585 83 07 and www.oib.gov.tr. 2- Katılımcılar ayrı ayrı olmak koşuluyla birden fazla taşınmaz için teklif verebilirler. Birden fazla taşınmaz için teklif verilmesi halinde bu teklifler birbirleriyle ilişkilendirilemez. hesaplarından birine yatırılacaktır. Dekontta, katılımcının ismi (katılımcının Ortak Girişim Grubu (OGG) olması halinde OGG’nin veya üyelerinden birinin adına düzenlenmiş olması yeterlidir) ile hangi taşınmaza ilişkin doküman alınacağı belirtilecektir. Her ne surette olursa olsun İhale Şartnamesi ve Tanıtım Dokümanı almak için ödenmiş tutarlar iade edilmez. Asgari %20 (yüzdeyirmi)’si Taşınmaz Satış Sözleşmesi imza tarihinde peşin, bakiye anapara borcu ise azami 12 (oniki) ayda bir ödeme yapılmak kaydıyla en çok 48 (kırksekiz) ayda ve eşit taksitlerle, bakiye anapara borcu üzerinden vade tarihleri itibariyle hesaplanacak vade farklarıyla birlikte ödenecektir. İhale bedellerinin vadeye bağlanan tutarına, Taşınmaz Satış Sözleşmesi imza tarihinden itibaren yıllık %10 (yüzdeon) oranında basit faiz uygulanacaktır. MESBAŞ-Mersin Serbest Bölge Kurucu ve İşleticisi A.Ş.’nin tamamı ödenmiş olan 10.804.320.- TL çıkarılmış sermayesi içindeki 2.296.656.- TL tutarında sermayeyi temsil eden % 21,26 oranındaki Türkiye Denizcilik İşletmeleri A.Ş. (TDİ)’ye ait hisse, T.C. Başbakanlık Özelleştirme İdaresi Başkanlığı (İdare) tarafından, 4046 sayılı Kanun hükümleri kapsamında “satış” yöntemiyle özelleştirilecektir. 1. İhale, birden fazla teklif sahibinden kapalı zarf içerisinde teklif almak ve görüşmeler yapmak suretiyle “pazarlık usulü” ile gerçekleştirilecektir. İhale Komisyonunca gerekli görüldüğü takdirde ihale, pazarlık görüşmesine devam edilen teklif sahiplerinin katılımı ile yapılacak açık artırma suretiyle sonuçlandırılabilir. hesaplarından birine yatırılarak “MESBAŞ İhale Şartnamesi ve Tanıtım Dokümanı Bedeli” ifadesini içerir şekilde ve üstünde ihaleye katılacak olan gerçek kişi, tüzel kişi veya Ortak Girişim Grubu’nun (katılımcının Ortak Girişim Grubu olması halinde Ortak Girişim Grubu’nun veya üyelerinden birinin adına düzenlenmiş olması yeterlidir) isminin de açıkça belirtildiği dekont karşılığında ve İdaremiz web sitesinde paylaşılan Gizlilik Taahhütnamesi’nin ihaleye teklif verecek gerçek/tüzel kişilerce ve Ortak Girişim Grubu’nun her bir üyesi tarafından imzalanmış olarak İdaremizin aşağıda belirtilen adresine başvurulması suretiyle temin edilebilecektir. Her ne surette olursa olsun Şartname ve Tanıtım Dokümanı almak için ödenen tutarlar iade edilmez. 3. İhaleye gerçek ve tüzel kişiler ile Ortak Girişim Grupları katılabilirler. Yatırım fonları ancak Ortak Girişim Grubuna dâhil olarak ihaleye katılabilirler. Ortak Girişim Grubu sadece yatırım fonlarından oluşamaz. 4. Teklif Sahipleri’nden İhaleye katılabilmek için yukarıdaki tabloda belirtilen tutarda geçici teminat alınacaktır. 5. Tekliflerin, İhale Şartnamesi’nde belirtilen hususlar dikkate alınarak hazırlanıp, en geç son teklif verme tarihi saat 17:00’ye kadar üzerinde “MESBAŞ SERMAYESİNDEKİ %21,26 ORANINDAKİ TDİ’YE AİT HİSSENİN ÖZELLEŞTİRİLMESİNE İLİŞKİN İHALE İÇİN TEKLİFTİR – GİZLİ” ibaresi bulunan kapalı bir zarf içerisinde İdare’nin aşağıda belirtilen adresine elden teslim edilmesi gerekmektedir. Son teklif verme tarih ve saatinden sonra İdare’ye verilecek teklifler değerlendirmeye alınmayacaktır. 6. İdare son teklif verme tarihini belirli bir tarihe kadar veya bilahare belirlenecek bir tarihe kadar uzatmakta serbesttir. Bu husus son teklif verme tarihinin sona ermesinden önce duyurulacaktır. 7. Özelleştirme ihalesi, 2886 sayılı Devlet İhale Kanunu’na tabi olmayıp, İdare ihaleyi yapıp yapmamakta, dilediğine yapmakta serbesttir. 8. Yabancı uyruklu gerçek kişiler ile yabancı ülkelerde kendi ülkelerinin kanunlarına göre kurulan tüzel kişiliğe sahip şirketler ve Türkiye’de kurulan yabancı sermayeli şirketlere hisse devri, yürürlükteki Doğrudan Yabancı Yatırımlar Kanunu ile ilgili diğer mevzuat hükümlerine tabidir. Teklif Sahipleri/Alıcı devrin mümkün olup olmadığını önceden araştırmakla ve ihaleyi kazanmaları halinde en kısa sürede gerekli işlemleri yapmakla yükümlüdürler. 9. Özelleştirme işlemleri her türlü vergi, resim, harç ve KDV’den muaftır. 10. 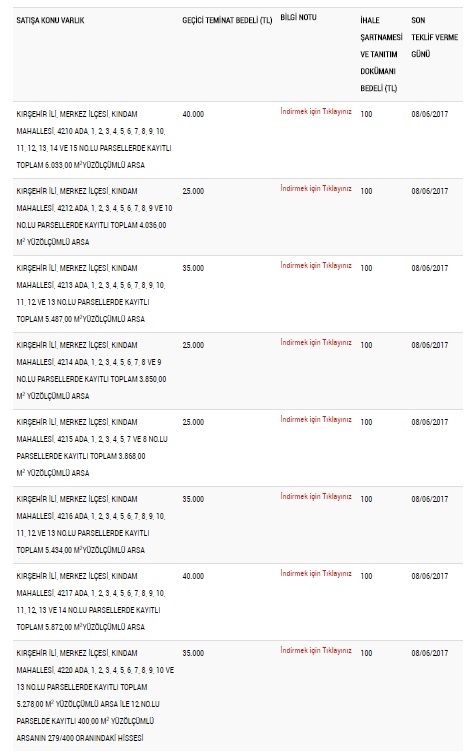 İhaleye ilişkin diğer bilgiler 0312 585 80 80 numaralı telefondan, 0312 585 83 07 numaralı fakstan ve www.oib.gov.tr adresinden temin edilebilir.